The dates for the fourth annual Unscripted Twillingate Digital Arts Festival has been announced today. It will start on run from Thursday 20 September until Sunday 23 September. As in previous years, the 2018 Festival will kick off with an opening reception and the opening of the four day long digital arts exhibit. This will be followed by a Kitchen Party with The Split Peas later that evening. The Friday schedule will have digital arts workshops, followed by the annual From the Bog and the Bay Feast with guest chefs and the festival continues on Saturday with workshops and a Saturday Soirée in the evening with guest entertainers Rum Ragged. This year the Festival will continue on Sunday with the third annual Amazing Root Cellar Race, a family event that combines a raced treasure hunt with tweets from root cellar to root cellar. The Race will be followed by a Great Big BBQ. “It is an exciting and full agenda with lots to do for folks of all ages – individuals, families and friends. 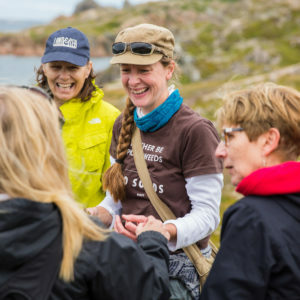 This year the festival will continue on Sunday to accommodate folks who want to make the most of their weekend in Twillingate,” said festival co-chair Wilma Hartmann. Workshop details will be announced soon and tickets will go on sale on 2o July 2018.